For those of you who haven’t seen it I wanted to tell you all about my little home in Second Life, the Games Park (SLurl). Here I have a whole bunch of games and some free T-shirts if you’re into Atari or Nintendo. … and over here, a chill-out area. 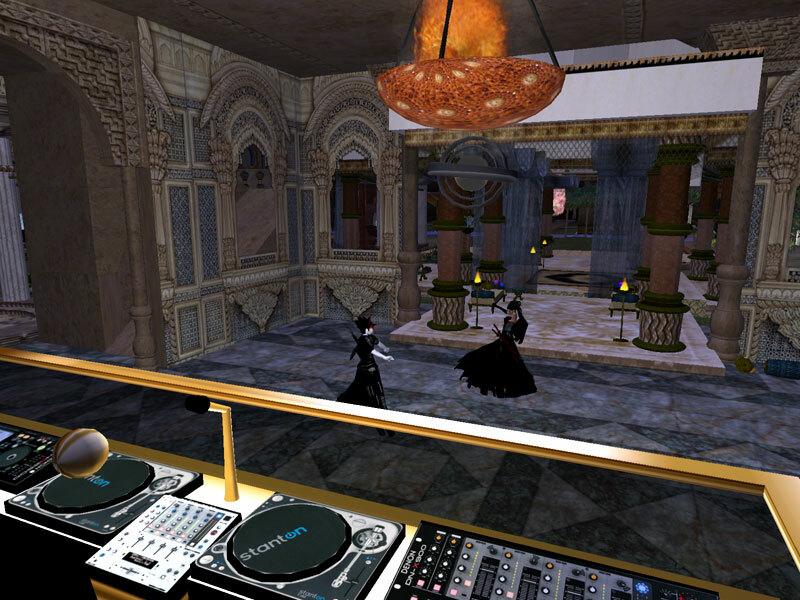 Those panels can be clicked for notecards about sites around SL and landmarks if you want to visit them. This whole thing might go away actually, I’m not sure. Things I can’t reveal are really moving at the moment. Basically: catch it while you can! I came across this thing installed at the Missing Mile (SLurl) after hearing about it from Sarah Nerd. Truth be told, I’ve been kind of warming up to the idea of buying my own Zombie Spawning Pool for awhile, but never had the opportunity to test one out. The concept is simple: stand on the green circle, and zombies will spawn all around you. Pull out a weapon, any weapon, and shoot ’em. When their health reaches zero, they explode and leave guts everywhere. What could be more wholesome? I started off using one of the kickass freebie guns they hand out at Missing Mile. By the way, for the record, any sim that hands out free guns is OK in my books! It’s not a bad gun but in mouselook these zombies kept getting the drop on me. Time to switch to a Samurai Island sword! What was funny about using the sword was that it was kind of useless, but way more fun. I’m not sure what it is about hacking at rotting flesh instead of shooting it that makes it so satisfying, but it really is soothing. Like taking a nap in a field full of daisies. It helps when you crank the tunes… I think I was listening to some Fear Factory. Anyhow, expect to get chewed on a few times by egg-headed zombies if your gun doesn’t completely rock, but also expect not to care. This is, inexplicably, a really fun toy. Definitely check it out. Oh, and a special thanks to MenuBar Memorial for coming by and taking the pictures! You rule! Patch Lamington has been around for close to 2 years, now, and almost all of that time he has been making doodle-things. He started with a doodle house, then became a doodle avatar. You probably know his doodle pads, and anyone who has seen The Show Must Go On! has seen the master of ceremonies – a doodle bot from Patch. Patch is escalating his doodle-ness to take in new realms, now, and if doodles take over the world, why, I’m sure humanity will be a lot happier than they are now. Read the rest of this entry ? I’ve received an urgent transmission and need your help! Beware the pink pony-tailed menace! 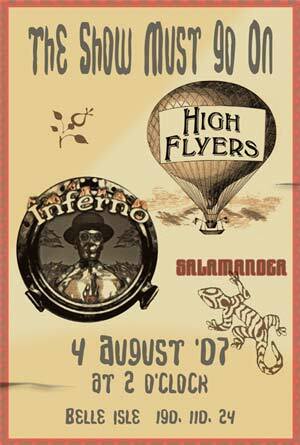 BEGIN TRANSMISSION 1 (07.31.07). S.O.S. – S.O.S. – IBM CODESTATION is breached. Infiltrator appears to be horrible pink beast with devastating pony-tails. Our defender, SENTINEL, is defeated – broken in four and scattered across Second Life. [See attached movie.] You are our last hope. Find the four parts and rebuild SENTINEL. The black boxes will lead the way. Prizes and glory await all those who complete the challenge… END TRANSMISSION 1 (07.31.07). 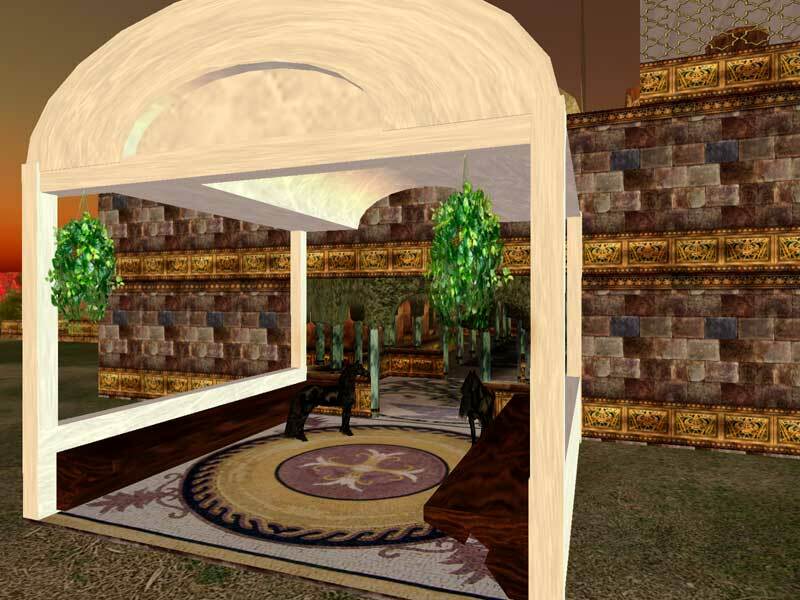 As role play areas go, I have to say that Samarkand is unique in that they control the style, but not really much of the content. You get “Masquerade” vampires and human goreans, sword fighters and magic users, angels and atheists, but in conversation they all seem to be on the same page about the tone and style of the environment. It’s an opportunity for people to take characters they play elsewhere and bring them into a new culture to see if there are new ways to make things fit. 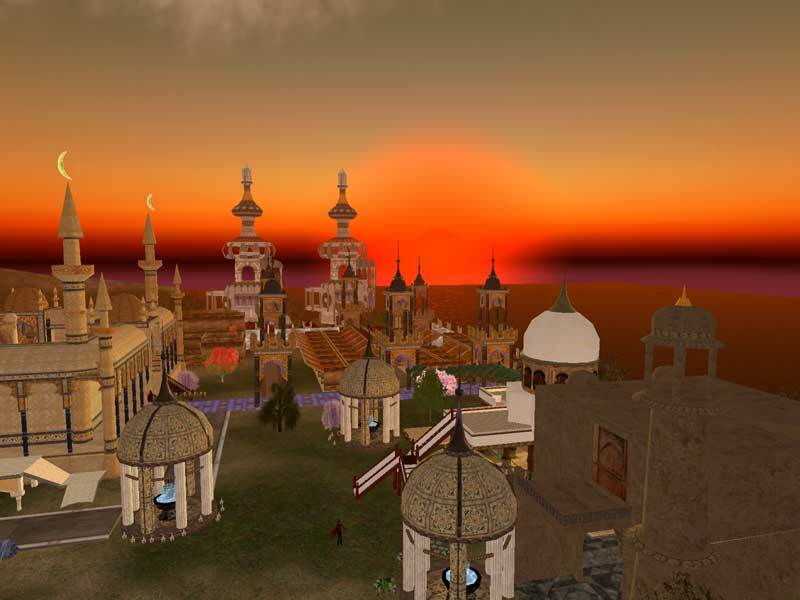 The architecture is a mix of Arabian, Persian and Indian opulence, and I found myself looking forward to the day when Windlight lets us control the lighting effects. This kind of build will really win out against others when shadows and light can play against each other in a more subtle way. It’s running on a class 5 server so the details popped into view fairly quickly too. The “Queen of Queens” in Samarkand is (currently) Pierce Malick, who would tell you that all of her subjects are loyal to her. That’s not completely true, however. There are always plots to overthrow the throne, but of course, none of the tribes will openly admit that to the Queen herself. Secrecy, politics, and strategy play as much a part in the daily lives of the city’s residents as DCS combat does. Of course, every sim needs a club. Samarkand’s is called “The Silk Rose Club” and keeps with the multicultural feel, broadcasting dance radio from China, Afganistan, Russia, Iran, and even a little European mix now and again. Like most clubs they hold regular events on Fridays and Saturdays, and they’re hiring dancers and escorts now if you’re interested. If you want to join in the general exotic fun at Samarkand, TP in and you’ll get notecards telling you how to join a tribe and meet interesting people. It’s nice to see somebody trying something unique, and I have a feeling old-time role players are going to love the refreshing change. Visit a fansite that’s already coming together mega-fast. The Plot: A group of Manhattanites document a monster’s attack of their city. THE BUZZ: This top-secret project set the Internet atwitter the week before Transformers came out last July. Known by the name Cloverfield or Clover, we understand it is a lower budget, NYC-set thriller from the pen of Drew Goddard, a veteran of the Buffyverse who first teamed up with producer J.J. Abrams as a writer-producer on “Alias;” another Abrams cronie, Matt Reeves, is directing. 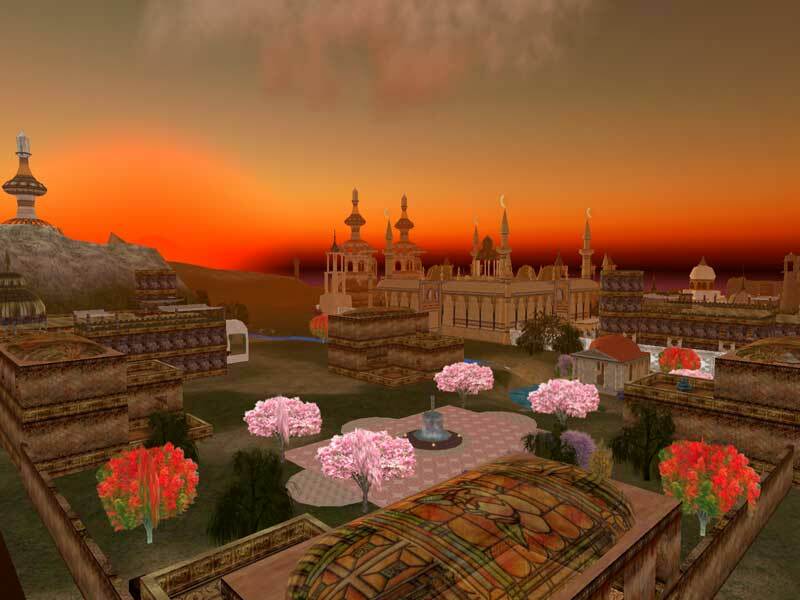 You are currently browsing the Second Life Games blog archives for August, 2007.